Click the "Clock (Analog)" or "Clock (Digital)" commands on the View menu. The Clock pane consists of either an analog or digital version of a clock showing the current local time. 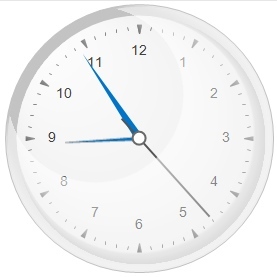 The type of clock can be selected from the View menu or by right-clicking within the Clock pane to access a context menu. Depending on the clock type and your preferences, the size of the Clock pane can be adjusted to better fit the clock by dragging the Clock pane's border bars. If you prefer to not see the clock, you can hide it by unchecking the Clock option in the View menu.